More MFT, Please? OK, You Got It! Well, you missed out on a good time if ya'll weren't at the hottest and loopiest release party on SCS last night. Yep, I'm talking about the My Favorite Things "Girl's Night In"! It was fun chatting it up with everyone, seeing all the design team's fabby creations and (for me) getting some good tips about flat irons for my hair! I need one so bad since I no longer have access to Shelbie's (our oldest daughter) CHI since she moved out. My hair gets so frizzy sometimes, you'd think I'd stuck my finger in a light socket! So I was thinking I'd get one for Mother's Day. Got any good suggestions for one besides a CHI? I don't want to spend so much money on it---there are other things to be had--like STAMPS!! Speaking of, what did ya'll get or plan to get from MFT's new release? I think they are all great and I'm not just saying that 'cuz I'm on the team. This has been one of the "funnest" releases for me! I had a blast creating my samples. 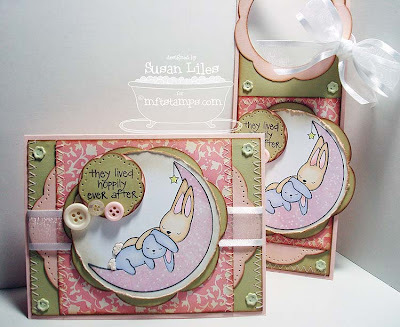 Today, I'm sharing a baby card I made using the Snuggle Bunnies set. It's really versatile and the other main image can even work for a card for your hubby or boyfriend, your child or anyone you like to "snuggle" with. After I made this card, I had the idea to make a matching door hanger for a baby's room. I just love the way they turned out with all the sewing, piercing, distressing and inked edges. Very shabby-chic, I think! I also got to use my new Blossom Nestabilities. I'm loving that shape! Anyway, after telling Eric about my flat iron dilemma and how much I NEED one, he said that it didn't sound like a very good Mother's Day gift, that it was more of a necessity and to just go get one for myself. OK! So now, maybe I will get to get some new stamping stuff after all! Oh wait, I need a pedicure, a haircut and highlights, too!! Can we do all that? Pleeeeeeasse? It's necessary that the princess looks good for her blog readers, you know. 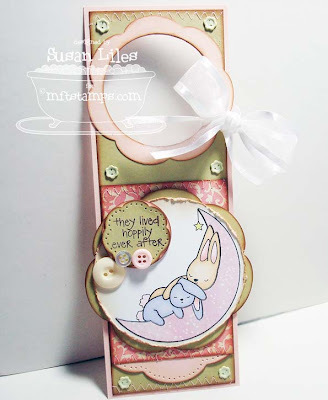 SUSIE Q-TIP: It's ok to run ribbon around a panel of your card without a bow or a knot. Sometimes the softer look of it speaks for itself. Oh, this set is just down-right precious! I love the pink moon, and the colors you chose! Uber pretty, Sus! I'm so glad I stopped yesterday afternoon and got to see this cutie patootie IRL!!! It is absolutely adorable. 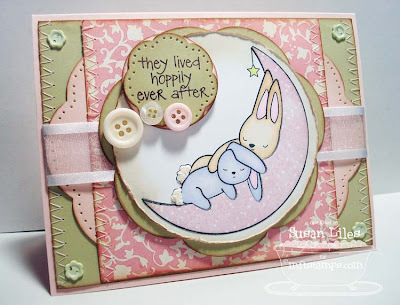 Cute set from MFT and a perfect use for it!! Those are gorgeous! I am in love with them! You did an awesome job! SO SO sweet! I adore your card. Your stuff is always so great, and I really like your tips!!!!!!!!!!! this is just soooo sweet! Soooo cute! Love these bunnies! The circles, the colors, the sponging...this is all perfection! Love it Susie! Hope the rest of the month is better. I totally know what you mean...I've had a scarcity of time for blog hopping too! Oh Wow! This is so soft and pretty! Love all the sweet embellishments. I think this is my favorite card made with this set! It is ADORABLE!! The door hanger is perfect!! I ordered this set and the owl set and can't wait to get them!! This is just unbearably adorable! Girlie, you have talent just oozing out all over the place :). Absolutely the sweetest things here. Love the colors ~ reminds me of something from my childhood... and that's a good thing! How adorable!! Love your little set.